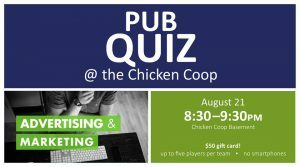 Books Are Just the Beginning and the Pub Quiz in Kearney is the only trivia game in town that’s been researched by nerdy librarians! With special themes each month and the amenities of the local bar venue, library staff and customers get to mingle and compete for prizes. For more information see the Events tab on the Kearney Public Library Facebook page: https://www.facebook.com/events/1657997217645691/.